Jetje, Mientje Zaligman and Izak Frank lived in a beautiful house at 34 Parklaan. All three of them were unmarried. Jetje and Mientje were sisters of Jozef Zalingman, who lived on Soembastraat. They came from Dwingeloo. Their parents were Betje de Vries (born 1862) and Wolf Zaligman (1852). Jetje was born on14 June 1901; Mientje was born on 2 May 1893. It was probably Jetje who did the housekeeping. Mientje, who was an accountant, worked for the firm of Lobstein, a wholesaler in spices, for many years. The Zalingman sisters loved art; they often visited the artist Hugo van Schaik. Did they have paintings by that artist? If so, where are these paintings now? 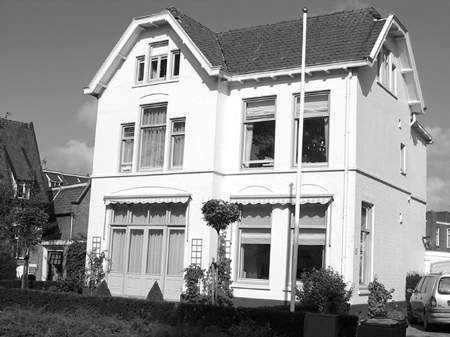 Izak Frank, owner of the house, was born in Meppel on 30 December 1866. He was the son of Levie Frank (1841-1891) and Klara van Goor (1839-1928). In 1865 Levie and Klara were married in Meppel, and a year later Izak was born. He had two brothers: Abraham Levie (1869-1895) and Jacob (1872-1934). Jacob was undoubtedly the best-known of the three brothers. He had a wholesale business in subtropical dried fruits on the Stoombootkade. The business had a very good name; shopkeepers from Meppel and the surrounding areas were his regular clients. Jacob was not only a successful businessman he also had social status in Meppel. He was a member of the Freemasons, the International Order of Good Knights Templar (an organisation devoted to abolishing the use of alcohol), Children’s Welfare, the Red Cross, the Bank for loans and public welfare, and The Organisation for the upbringing of abandoned or neglected children and orphans. He was also the founder and chairman of the Economic Union, division Meppel, the origin of the Liberal Democratic Association, now known as VVD (liberal party). He was a very charitable man. His neighbour found this out in a painful way, when he gave one guilder to a Jewish ‘sjnorrer’ (beggar) and overheard the man say: ‘Oh, I must be wrong, I usually get much more.’ How much people appreciated Jacob became clear at his funeral on the 23rd of December 1934. The Jewish Cemetery had never been as crowded as on the day of Jacob’s funeral. An impressive gravestone is a remembrance of that day. On the stone are the symbols of the Order of Freemasons and a poem written by Jacob himself. For every deed love should be the beginning and the end. After Jacob’s death, his wife Mientje Cats left Meppel. She was murdered in Auschwitz. Mientje also left a distinctly visible place behind in Meppel. At the Jewish Cemetery in Meppel there is an empty place to be seen, the place where Mientje’s gravestone should have been, next to that of her deceased husband. The widow of Mr Frank sold the business on the Stoombootkade on15 February 1935 to Miss A. de Zwaan and Ph. Boomstra. The business kept the name Fa. L. J. Frank. The business survived the war and continued. Mr Boomstra, who was Jewish, lived in Amsterdam and none-Jewish Miss de Zwaan lived in Meppel in Emmastraat. Mrs Valentijn remembers from the time Boomstra was director that she shared a small office with Boomstra and Van Es. Both gentlemen wore the Star of David on their jackets, but took it rather lightly. Wrongly! Mr and Mrs Boomstra both died. Mr Boomstra did go into hiding, but was found. Both daughters had immigrated to America just in time. After Mrs De Zwaan had died (in the war), the firm was continued by a number of employees: Ulrich, Van de Belt and Feddema. Especially Feddema developed products like starch, glue and surrogate jam, to get through the war. After the war the company came into the hands of the Boomstra heirs, who continued the business on the back burner till the end of the Fifties. Then the firm disappeared from Meppel. However … the name ‘L.I. Frank’ later appeared at Twello. Possibly the heirs have sold the licence to somebody in that area. The first years of the war Izak, Jetje and Mientje spent together. They must have been talking a lot about what the future would hold for them. Izak Frank, because of his age, did not have to go to a work camp; ‘luckily’ he could stay in Meppel with his two landladies. The Misses Zaligman sensed just like many other Meppel Jews that they had to leave Meppel. They decided to hide their valuable objects in the house of their neighbours. Afterwards… when they came back, they could come and get them back. One of these neighbours was the widow of the tobacco manufacturer Jakobs. She lived in a house on the corner of Wilhelminapark and Zuideinde. The old lady received among others things some sort of brass lamp. Because Jetje and Mientje never came back, that lamp stayed in the hands of the Jakobs family. Recently the lamp was given to the Historical Centre in Meppel. 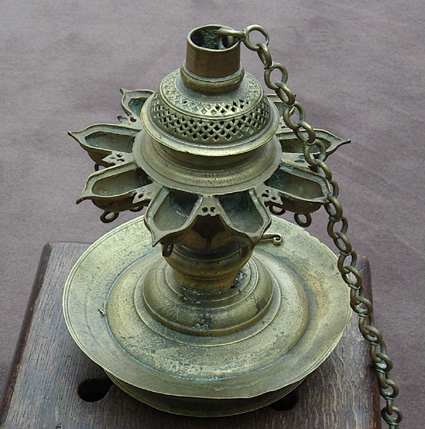 The ‘oil lamp’ the Misses Zaligman hid with one of their neighbours. The end of their stay in Meppel still came unexpectedly. It began on 27 September with a letter from the Mayor of Meppel, in which they were ordered to evacuate the house for the German Forces (Wehrmacht) and to look for alternative accommodation. Of course all furniture, lamps and curtains should remain in the property. 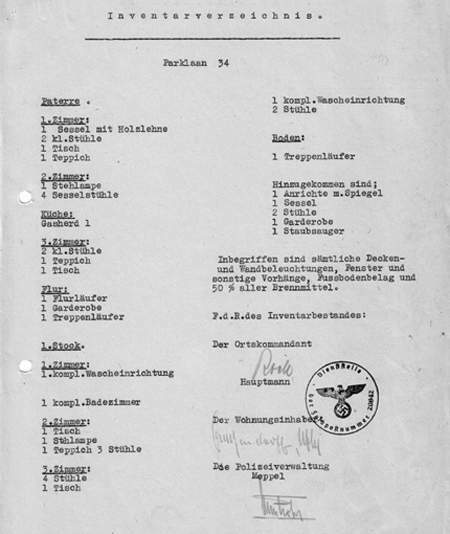 confiscated by the Wehrmacht (German forces). The ladies moved in with the Lobstein family, Mientje’s employer, and there they were among the first people in Meppel who heard that they and the other Meppel Jews would be transported to Westerbork. On the 2nd of October 1942 I received a message from the Misses Zaligman if I could come to the house of Mr Lobstein, concerning an urgent matter. The exact time I do not remember precisely, but I do remember it was very dark. I believe it was about nine-thirty. The Misses Zaligman received me in the presence of Lobstein and informed me that that same night all Jews had to leave Meppel. It is not known if Mr Frank lived with the Lobstein family, but it is certain that what the ladies heard was right. In the night of 2 to 3 October all inhabitants were taken away from the Lobstein residence and taken to the station, including Jetje, 41 years old, and Mientje, 49 years old. Izak Frank was also arrested in his bed, so cruel at his age, (he was then 75 years old) by Meppel policemen. In Westerbork, Izak, Jetje and Mientje would still have some support from each other. All three stayed at this camp for almost a month. Izak would be the first to be transported to Auschwitz. On the 23rd of October he left the camp together with 987 other Jews. Three days later he breathed his last. The Misses Zaligman stayed at Westerbork a week longer. On 2nd November 1942 they left Westerbork and died in Auschwitz on the 5th of November 1942. Again two young lives were cut short. on Parklaan (now known as Wilhelminapark).